Smeaton produced more reports and drawings on harbours than any other civil engineering topic. He advised on 30 sites in England and Scotland, yet his work resulted in construction at just nine locations. It's likely that the benefits of Smeaton's ideas were recognised but it was difficult to raise the funds. His first constructed harbour work was at St Ives, although his first design was for Rye Harbour (1763-64), where he proposed a new channel. At St Ives, he designed a larger replacement for the existing pier  Smeaton's Pier, the only structure to commemorate his name. At Eyemouth, Smeaton improved the harbour, which had remained vulnerable to northerly gales despite its pier. In 1767, he designed a new masonry pier faced with sloping courses of massive stones of up to 3 tonnes each. He was to use this arrangement again and it was adopted for several 19th century harbours. 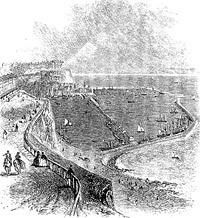 Work began on site in 1773 at Portpatrick, the departure point for the shortest crossing to Ireland. His resident engineer was John Gwyn (not to be confused with bridge builder John Gwynn). 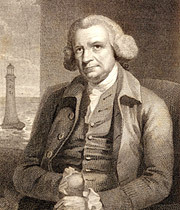 Smeaton modified his design in January 1774 to include a rounded pier head with dovetailed external masonry "Eddystone fashion". The harbour was completed in 1778. He added a stone revetment alongside the pier in 1782 following storm damage. In 1770, Smeaton submitted a report recommending the construction of a granite pier at Aberdeen, a natural harbour where ships sailed up a channel of the River Dee to the town quay. A sand bar had built up outside the harbour, hindering access. The pier would run along the north side of the river mouth and periodic dredging would be done beyond the pier head. John Gwyn left the Portpatrick works to take charge at Aberdeen, shipping construction machinery on the Forth & Clyde Canal. Work started in January 1775 and was completed on 19th October 1780. The scheme increased the depth of water over the bar at high tide by just over a metre, but it also amplified wave action upstream. To combat this, Smeaton designed a catch pier  a low-level projection of the north pier  and advised rebuilding the south pier to a shorter length. This work was carried out between July 1788 and December 1790. Thomas Telford (1757-1834) designed further works at Aberdeen in the following century. In 1772, Smeaton was consulted about Peterhead Harbour, as its south pier was in poor condition. He recommended rebuilding it to a different alignment and reconstructing the smaller west pier. Gwyn developed these ideas into the final design and work began in 1775. The project was completed in 1781, with some storm repairs in 1776. At the existing Ramsgate Harbour there was a problem with siltation. Smeaton recommended constructing a walled basin within the harbour that would fill at high tide and release its water through six sluices at low tide, scouring the outer harbour. Preston suggested extending the basin wall and adding gates for shipping access. Both proposals were accepted. Work began in 1776 and was completed in 1781. Preston took charge but died within a year and was succeeded by Edmund Hurst. The new town of Cromarty, created in the 1770s, and its small sheltered harbour benefited from Smeaton's designs. Again using John Gwyn, work on the north pier began around 1781. In 1783, Smeaton decided that rather than continue extending the pier, he would construct an offshore breakwater almost parallel to the shore. He returned to Austhorpe, content to leave the details to Gwyn. Work was completed in 1784. In August 1782, the trustees of Ramsgate Harbour consulted Smeaton about the construction of a dry dock. He visited Liverpool to examine its docks before work began at Ramsgate. Smeaton proposed a timber floor but resident engineer Henry Cull had other ideas and constructed a flat inverted masonry arch but this failed on completion and Smeaton's original design was implemented. Smeaton also designed an advanced pier at Ramsgate. In July 1792, Smeaton's resignation as Ramsgate Harbour engineer on the grounds of ill health was declined  he was to die in post. The last of Smeaton's constructed harbour works, dating from around 1791, is a narrow harbour with dock for a new town in Cornwall  Charlestown Harbour was built 1791-1800. Smeaton, sadly, did not live to see the work completed. Plan of the masonry pier Smeaton designed for Eyemouth Harbour in 1767. View of Ramsgate Harbour after completion of the new walled basin.